In the previous post, Understanding the Medieval Cathedral – Part 1, we made an attempt at recapturing the sights, sounds, and experiences of a medieval visitor to a Christian cathedral. We began by conducting an examination of the typical layout of such a cathedral (see below). In part 2 we will pass through the enormous oak doors of the west front into the interior public spaces beyond and try to get a glimpse of what would have gone on there. As we previously noted, the west front, as the main entrance, was generally the most elaborately decorated part of the exterior façade. Already, our medieval visitor would have been overawed by his initial approach to the cathedral complex. Very likely the largest structure he had ever seen (probably by a very considerable margin), his view of the massive towers, pinnacles, and spires against the skyline must have given him a great sense of awe and anticipation. He could begin to make out the profusion of carving and statuary along the west front as he entered the cathedral grounds through the maze of beggars, food vendors, and merchant stalls selling candles, pilgrim badges, and other mementos. Passing through the central doorway, he would have entered either a small receiving area known as a narthex—usually partitioned off in some way from the main nave of the church—or the nave itself. During the middle ages, a narthex would have been set aside for penitents or those receiving instruction but not yet admitted into the congregation. Generally, one can see into the nave from the narthex, but its full grandeur is only revealed to those admitted deeper into the building. Once into the nave, one has entered the beating heart of the cathedral. For the medieval Church, the nave was where its public life was carried out. This was the only area where the laity were commonly admitted for regular worship—the major exception being specific shrines located elsewhere in the building where sacred relics were housed. A special fee or donation would have been required to enter these. Then, as now, the most common response upon entering the nave of a medieval cathedral is to look upward. This is no accident. The designers and builders intentionally sought to draw a visitor’s eyes towards heaven. Before technology and innovation allowed builders to create structures of extreme height, this was done through the use of elaborate wooden ceilings, eye-catching colors, or both. As the Romanesque style developed (often called the Norman style in England), medieval builders revived the classical technique of utilizing rounded arches to achieve greater height and openness. This technique, while a great leap architecturally, still required thick, solid walls and heavy columns. As a consequence, it limited the amount of light that could be admitted through relatively small windows high up towards the roof. With the introduction of Gothic architecture, with its pointed arches and external buttresses, builders could really begin to push the limits of both ceiling height and the number and size of window openings simultaneously. These innovations made possible the creation of such splendid masterpieces as Salisbury, St. Denis, Notre Dame, and Chartes, among many others. Without a doubt, the spectacular results of these new techniques are shown to their best advantage in these soaring, light-filled naves. The public space within the nave would have extended as far as the crossing (the intersection of the nave and transept). Within the crossing would have been a lectern, from which Scripture readings would have been made, and an elevated pulpit. The area beyond the crossing, called the chancel, was generally reserved for the clergy. It was often segregated from the nave by an elaborately carved and/or painted screen, many of which survive to this day. We will examine this space in a future post. It would be here in these spectacular spaces that the faithful would worship, receive the Eucharist, listen to sermons, and generally receive the comfort and encouragement, as well as the admonition and correction, of the Church. During the medieval period, the rows of chairs we see in cathedrals today would not have been there. Instead, congregants would have stood or sat on the floor. Some would even have brought blankets and cushions from home, as these stone-built structures would have been quite chilly even in mild weather. The only seating provided would have been in the form of benches against the walls. Many believe that an allusion to this arrangement is found in Act 1 Scene 1 of Shakespeare’s Romeo and Juliet where the servant, Gregory, observes that “…the weakest goes to the wall.” (Stemp, 2010) The insinuation, it appears, is that only the weak and infirm would frequent the benches along the aisles. 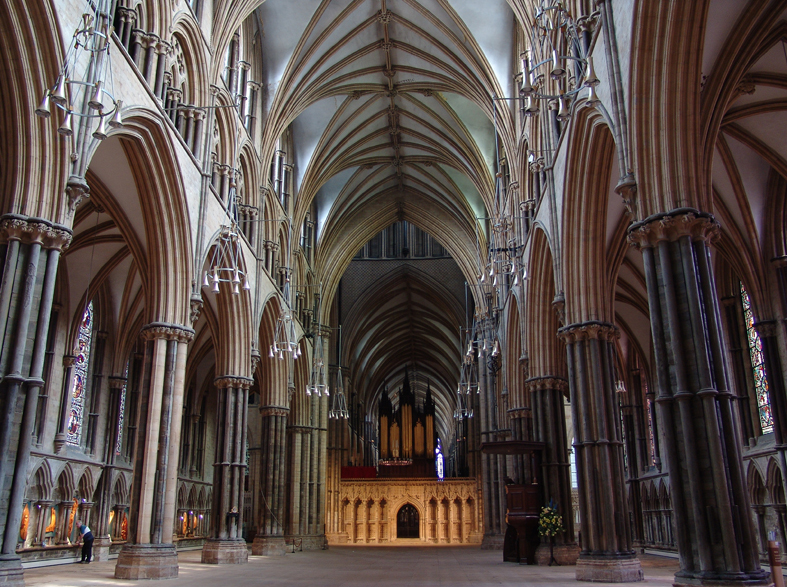 Nave of Lincoln Cathedral, England. The position of the choir screen leading into the chancel can be seen at bottom center. The wooden pulpit is right of center and the stone benches running along the aisle can just be made out on the far left. The decoration in the nave would have been much more colorful than we see today. Over the centuries a great deal of the interior painting has been lost. It is important to note that these elaborate design elements were intended as much more than simple embellishment. As the vast majority of the medieval population was illiterate, the interior decoration would have also been designed as a form of teaching aid. 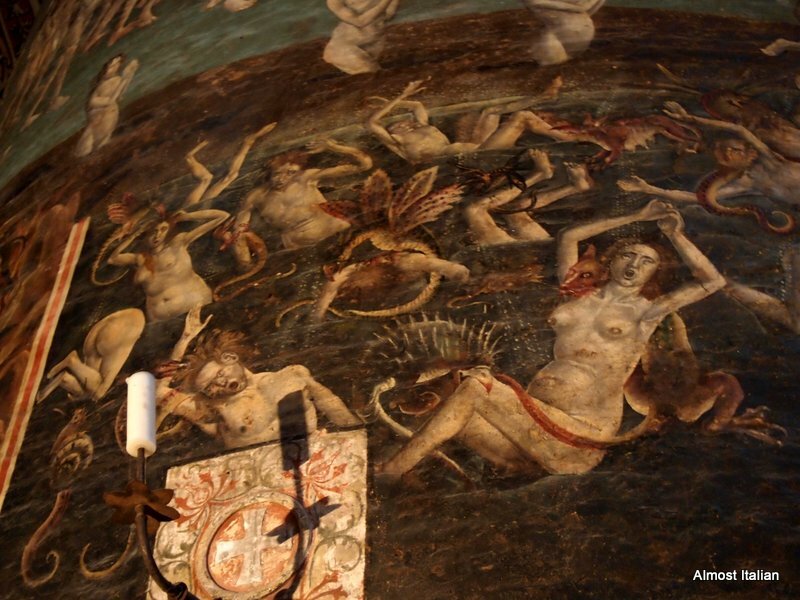 One can imagine the preacher, standing high up in his ornate pulpit, drawing the congregation’s attention to a graphic painting of the last judgement (sometimes called a “doom painting”) when teaching on the consequences of sin. In fact, he could employ any number of useful visual aids, from Biblical scenes executed in paint or stained glass, to sculptures depicting angels, demons, saints, and even kings, whose reigns were thought to be ordained by God. Therefore, the building itself would have played a much more interactive role in the worship experience of our medieval counterpart than is usual with us. It reminds me a bit of my childhood Sunday school teacher using a large felt board with changeable scenery and characters as a teaching aid to illustrate Bible stories. The services themselves would have contained a considerable amount of display and ceremony. The choir, priests, clerks, and other chapter officials would have filed in through the great West Door in solemn procession, chanting or singing as they came. They would have carried with them a number of important ceremonial objects. Among these would have been an elaborately bound Bible, an ornate gold cross on a stout pole, and a table or tray containing the consecrated bread and wine for the Eucharist. Moving slowly up the nave into the crossing, most would have passed on through the screen into the chancel, where they would have remained until they filed back down the nave at the end of the service. Although much of the service would have been conducted in Latin (including the singing), the sermon, at least, would have been given in the local language (Zaleski, 2016). Even though very few laypersons would have spoken Latin, with repetition and some basic instruction, most would have developed a reasonable understanding of the proceedings and presumably would have come away inspired, comforted, and, in some cases, depending upon the subject matter of the sermon, thoroughly frightened. In our next installment, we will discover what is behind that mysterious screen when we examine the more restricted area of the cathedral known as the chancel. Stemp, R. (2010). The Secret Language of Churches & Cathedrals. London: Duncan Baird Publishers, Ltd. This entry was posted in History and tagged Cathedrals, Christian Churches, Gothic Architecture, Lincoln Cathedral, medieval, Medieval Cathedrals, middle ages, Notre Dame Paris, Sainte Cecile, Salisbury Cathedral, Vezelay. Bookmark the permalink. Your pictures are great. I love that one of Lincoln. I think it’s the symmetry and perspective. Pity about the blue notice! Thanks, Andrew. I looked at a lot of pictures before selecting that one. The perspective is quite impressive. Unfortunately, my personal photos never turn out so well.